This latest developer diary for Hunted: The Demon's Forge has a ton of information. The makers of the game discuss the story, settings, and inspirations for the upcoming co-op title. Lucy Lawless, who plays the voice of Seraphine, is featured prominently. Judging from this video, the devs have crafted a deeper story than we usually get from hack and slash games. 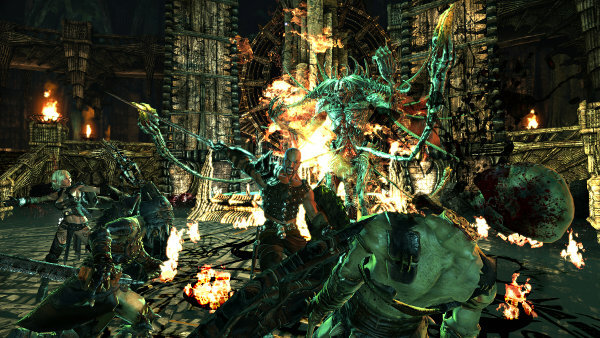 The story will be more than just a mere suggestion as to why you're killing everything between points A and B.
Hunted: The Demon's Forge will release on May 31 for the Xbox 360, PlayStation 3, and PC. The game will support two player local and online co-op. Warning: There are a few spoilers here. Very little is said outright, but the allusions to the themes and plot points are laid on pretty thick. Page created in 0.2896 seconds.